Use the right wood for the right job. 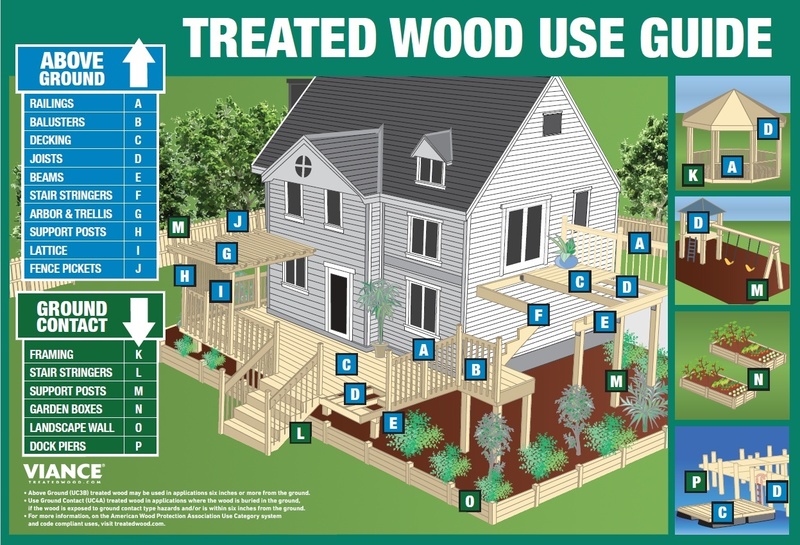 For residential use, there are two classifications of treated lumber, Above Ground and Ground Contact. Viance provides unsurpassed preservative solutions for both types, Ecolife and Severe Weather brands for above ground applications and the Preserve brand for both above ground and ground contact applications. Ecolife is non-metallic, above ground formulation to help fight the elements such as exposure to rain and the sun’s UV rays. Above Ground is for use in applications that are six inches off the ground, typically used for decking, railing, balusters, decorative posts, trim boards, joists, beams, fence pickets, framing, arbors, and trellises. Preserve offers specific formulations for above ground or ground contact use for both CA and ACQ preservatives that are designated on the end tags. Preserve formulations are used for specific wood species to attain proper retention levels for long-term performance. Preserve ground contact formulations are used for posts, stair stringers, framing, garden boxes, landscape walls, in freshwater, or other situations favorable to deterioration, and for components six inches or less from the ground. It can also be used where lumber may be difficult to maintain, repair or replace and are critical to the to the structure, in areas exposed to ground contact type hazards due to climate, artificial or natural processes or construction, and in areas with poor air circulation. Preserve formulations tagged for above ground use are used in decking, railing, balusters, decorative posts, trim boards, joists, beams, fence pickets, framing, arbors, trellis and other above ground applications. Ecolife and Preserve formulations penetrate deep into the wood and are backed by a Lifetime Limited Warranty against fungal decay and termite attack. Preserve CA protects wood with Copper Azole (CA) and is used for both ground contact and above ground use in the appropriate retention levels. The proper use is noted on the end tag of each board. Preserve ACQ protects wood with an Alkaline Copper Quaternary preservative and is used for both ground contact and above ground use in the appropriate retention levels. The proper use is noted on the end tag of each board. Formulations are used in specific wood species to attain proper retention levels for lasting performance. Ground contact retention levels are also suitable for freshwater immersion applications. Both Preserve products provide long-lasting protection against fungal decay and termite attack. Preserve C and ACQ are not suitable for direct contact with aluminum or uncoated metal products. Ecolife and Preserve CA and ACQ are backed by a lifetime warranty against fungal decay and termite attack. Ecolife and Preserve CA and ACQ are not available in all markets.